Did you know June is National Candy Month? Yeah, I didn't know either, or at least not until a couple of days ago. Anyways, today's post is going to be a little different than the usual because I don't think we've ever shared a sweets haul on the blog. I wanted to share our haul with you guys because these candies are pretty neat and if you end up at the places we went to in the future, you might want to get some for yourselves too. Believe it or not I'm actually a big sweets person. My love for sweets is probably on the same level as my love for masks. That's saying something. Whenever I travel, I like to try the local's sweets, whether it be candy, chocolate, or dessert, and I like to take back a few if allowed. This trip, my family and I happened to visit two places with a list of sweets I know I wanted, so I made sure I got them. We visited Toronto, Canada and Universal Orlando (Harry Potter world~)! I will be writing about the places we visited and sharing our experiences with you guys. Anyways, let's jump right in to my sweets haul, shall we? 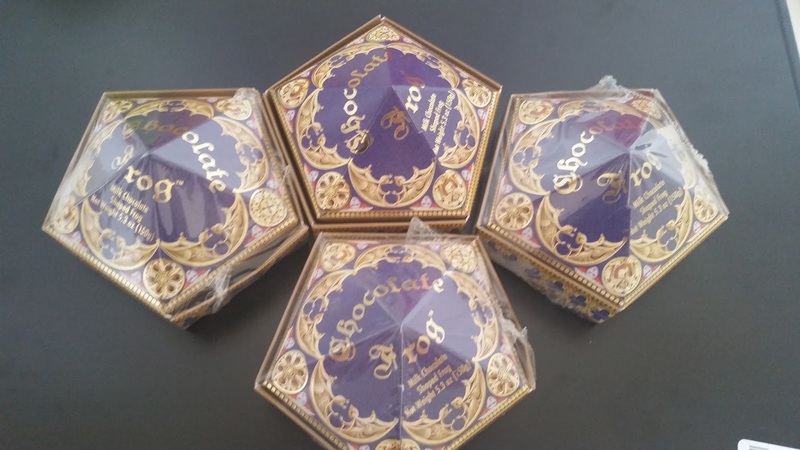 Chocolate Frogs. If you've watched the Harry Potter series or read the books or visited the theme parks or heard about these creations, then you already what these are. If you haven't done any of the above, then Google will be your best friend. If you are too lazy to Google, then the long story short is that these were popular chocolates packaged with famous witch/wizard cards and sold in the Harry Potter movies. In the movies, the chocolate frogs also acted like real frogs in that it, well, it can jump around and stuff like a real frog. As the park guy said (I think his name was Jeremy or Jerry...something with a J), unfortunately the chocolate frogs being sold at the park does not jump like real frogs because the Ministry didn't think muggles were ready to handle the 'real' chocolate frogs. He was totally into it, he really loves his job, and I was totally okay with that. I only opened one of my chocolate frogs because two of them are gifts. The wizard card I got in the one I opened is Godric Gryffindor. Not bad I'd say. The cards are holographic with a short description of the person on the back of the card. 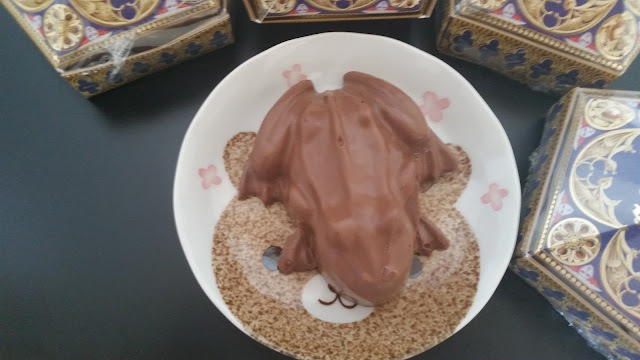 I opened one of my chocolate frogs mainly to make sure the frog hadn't melted because Florida can be quite humid and hot, and California is just hot. I wanted to make sure that my chocolate frogs didn't become a chocolate puddle during my travels. It looks like it survived though. The chocolate is average at best. Not the best chocolate I've ever had but not the worst either. Not sure if you can see it in the above picture or not but some parts of the chocolate is very fragile and the forelegs actually broke off. 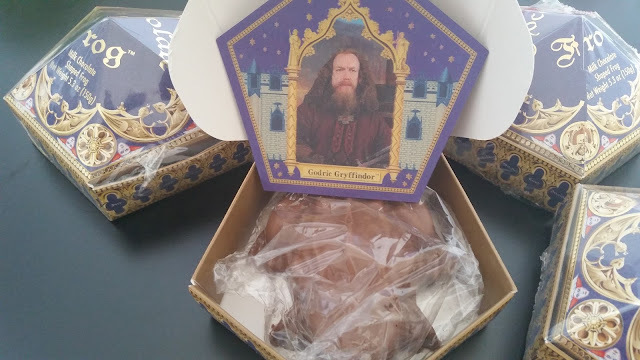 I ate this chocolate frog already but I am keeping the other unopened 3 in the fridge, just in case. This was once filled with candy but as you can see, I've eaten quite a few of it. This is a jar of wine-gums. The candy was mentioned in the 4th book: Harry Potter and the Goblet of Fire. To be honest, I don't remember that mention at all and that mention was not the reason why I bought this jar of candy. Instead when we were browsing the candy store and Mom and I just decided to give this one a try. We love it, by the way! Maple sugar. 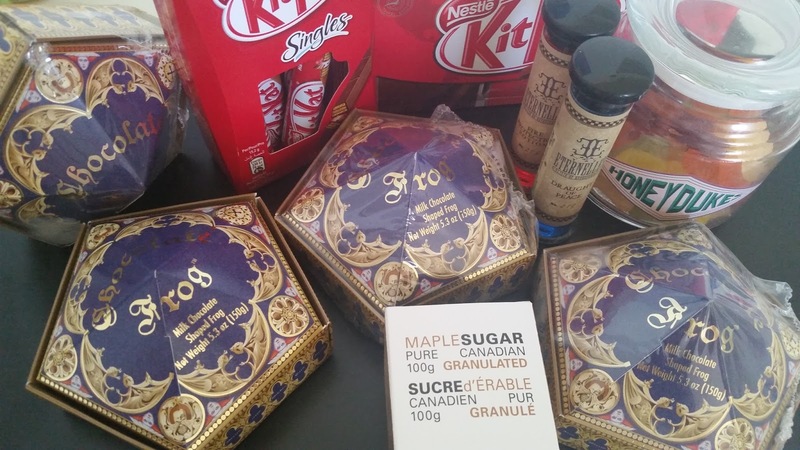 I think every one of our trip to Canada we've picked up something sweets related. Whether it be maple sugar, maple syrup, Ice wine (it's sweet so it counts right? 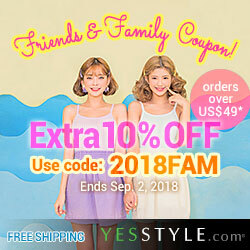 ), Cadbury chocolates, and more. I've heard a lot about Ninutik, it was actually recommended by a friend, so when I saw this (at a museum O_O), I decided to get it. Our friend actually recommended their Cube 57, but seeing as we didn't want to go out of our way to get it and because we came across this granulated version first, we decided to try this for now. 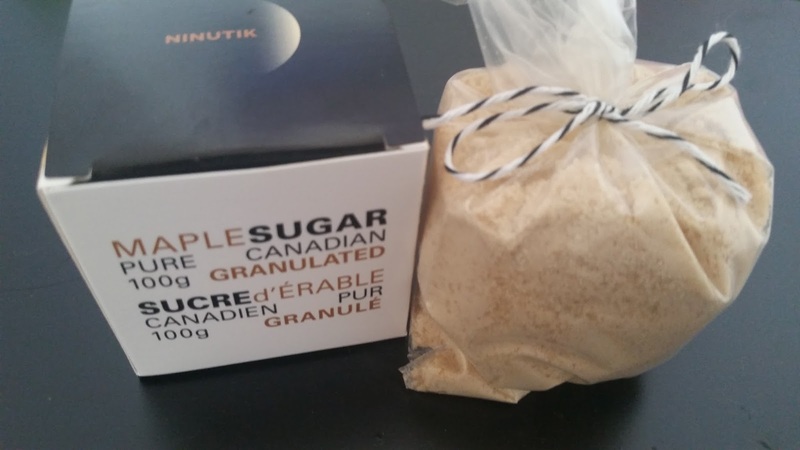 The granulated version is part of Ninutik's Sweet 100 collection. 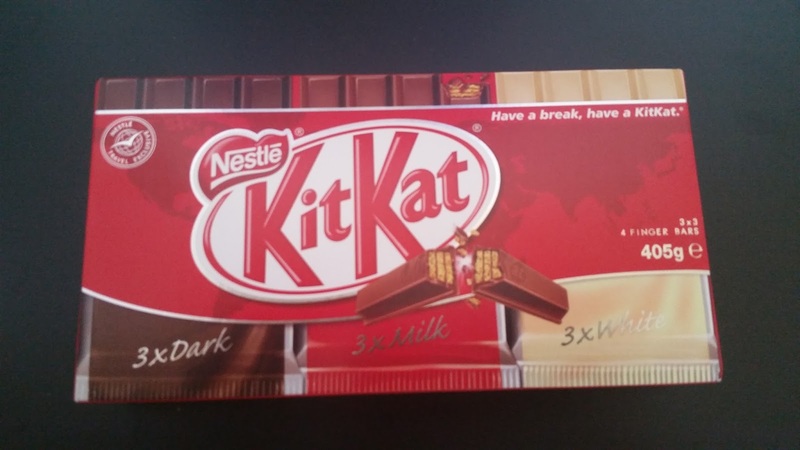 KitKat are found pretty much worldwide and they happen to be one of our (Mom and I) favorites. If you ever heard of the infamous variety of flavors found in Japan than you'll know that these regular milk chocolate ones are far from unique. However, I must say that it is my first time seeing these long KitKat singles. I'm not sure if it's just me but I've always found that KitKat in Canada taste a lot better than KitKat in the US. I want to say it's the chocolate but I can't be 100% sure. I just know that I always pick up some KitKat when I'm in Canada. More KitKat, yay! 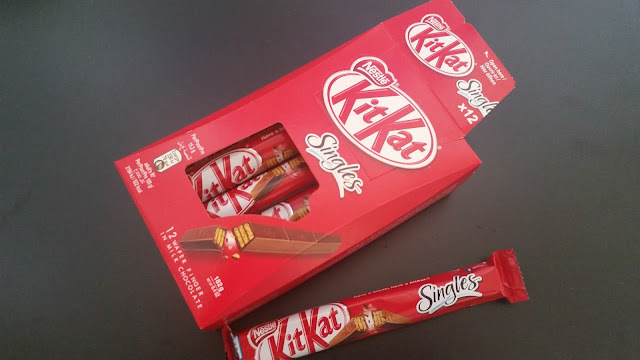 So, this box of KitKat was in the same location as the single ones above. It was only after I decided I wanted the Singles did I notice these and oh did I want them. I've never tried the Canadian version of white chocolate KitKat and have always wondered if they also taste different too. So I couldn't help myself and got these too. These were the splurge of the moment buys. They weren't on my to buy list until I saw them. 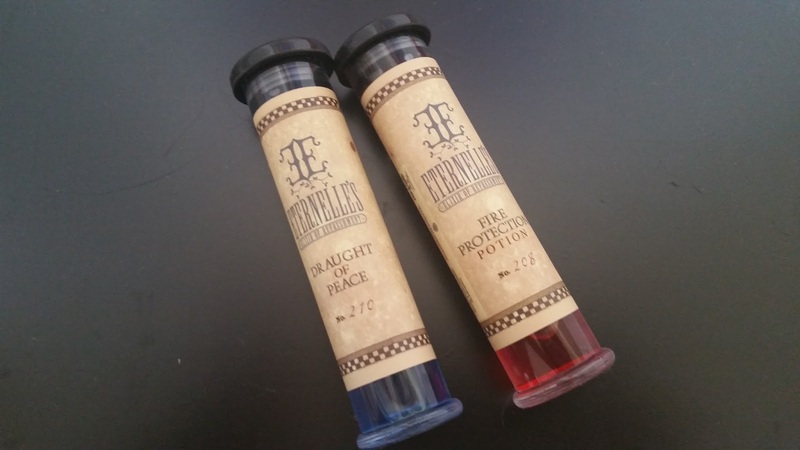 The Eternelle's Elixir of Refreshments came in 4 different flavors and we got the Draught of Peace and Fire Protection. Mom and I both decided that we like these two the most out of the 4. If you are planning to buy these and taking them home whole we suggest bringing some ziplock bags and plastic bags. We always bring spare ziplock bags, just in case, so we put these 2 elixirs into out ziplock bag and put the ziplock bag into a plastic bag. Wrapped it tight and put it in out check in luggage. Not sure if you can bring these with the carry-on bags, we didn't want to chance it. The blue, Draught of Peace, ended spilling a little. Luckily we had wrapped it up pretty good so it didn't get anywhere other than inside the ziplock bag. 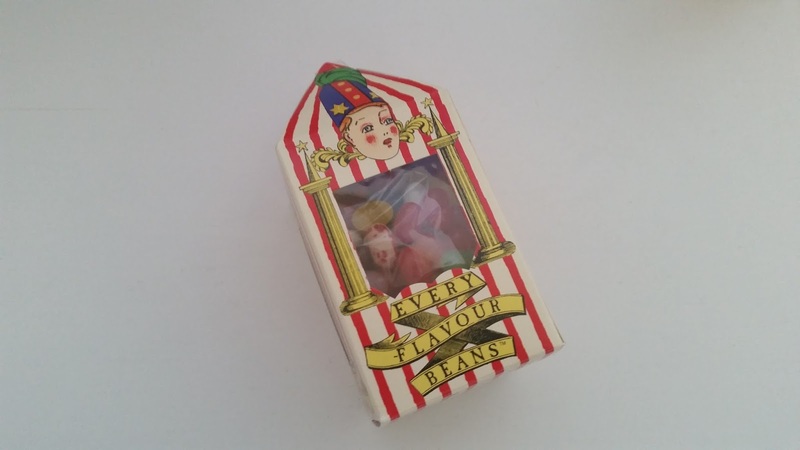 Finally, how can we go to the Wizarding World of Harry Potter without getting some Bertie Bott's Every Flavour Beans. I don't know why I forgot to take a picture of this but when I was writing up my post I realized that I didn't put this in with everything else. So here it is, with a different background. Anyways, I have a feeling I'm going to get some nasty flavors out of this but it's the unknown that's fun right? Mom and I are going to have a marathon while playing the guess what Bertie Bott's Bean you got game. It should be interesting. Okay, that's all for my haul post. Let me know if you like posts like these once in a while. 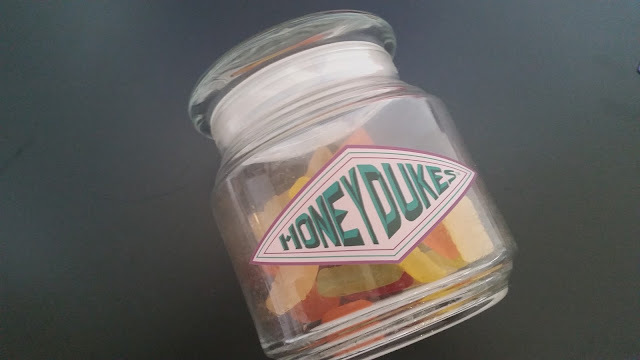 Would also love to hear your recommendations in terms of sweets!